A 12-year-old boy has invented a Braille printer that costs about $1,650 less than the ones that are available today. Shubham Banerjee is in grade seven in Santa Clara, California. He used a Lego Mindstorms kit and added five dollars’ worth of parts he bought at a hardware store to create what he calls a Braigo. His Braigo costs about $349 to make. 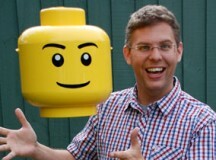 A new study says that the faces on Lego minifigures have become less happy and more often mad or sad. The study was designed to find out if the Lego characters have become grumpier over the years. Christoph Bartneck works at the University of Canterbury in New Zealand. He loves Lego and even worked for the company in the 1990s. He worked with another researcher on the project. They looked at all of the 6,000 figures made between 1975 and 2010. They made a note of each figure’s facial expression: happy, angry, afraid, disgusted, surprised or sad. 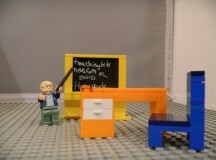 How would you like to go to Lego school? That’s just what some kids will get a chance to do, when the new International School of Billund opens in Denmark this August. The school was built by the owner of Lego, Kjeld Kirk Kristiansen, who lives in Billund. He is the grandson of the man who founded the company. And, just like many kids have built Lego towns, billionaire Kristiansen and his family have used their money to build a church, an airport, a library and a theatre in the town of Billund. The school will be start with kids aged three to seven and expand to include kids up to age 16 by 2015. Two teenagers in Toronto, Ont. have taken a giant leap – for themselves, and for one little Lego man. The teens launched a Lego figure into near-space. They hooked a helium weather balloon, a home-sewn nylon parachute and four cameras to the figure. And then they went out to a soccer field and let their contraption go. The cameras were set to take pictures every 20 seconds. When their figure came back to Earth, they looked at the pictures the cameras had taken. 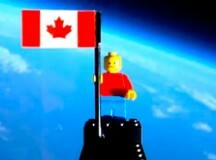 They were shocked to see their little Lego figure, clutching his Canadian flag, with a picture of the curved horizon of the Earth in the background.